I have a question for you: Why are cake and ice cream fattening? Now, I realize there are some out there boasting “no fat”, but come on! We both know they taste like crud with a strange aftertaste! Chunks, I could go into a lot of information about fats and sugars, etc. but the real answer is that God has proven once again to have a sense of humor. For instance, I’m confident God was giggling when he created the platypus. Why do you think God doesn’t do any of the big miracles anymore like turning people into pillars of salt or raining down fire on cities? I’m certain it’s because he’s out having fun somewhere. My guess is he’s hanging out with otters. Playing around and eating food off his belly. He probably chuckles as he thinks of the cruel joke he made by making everything tasty to be bad for you. All you can do is chuckle along with him and appreciate his off beat sense of humor. One suggestion is to stay away from fat free cheesecake. It’s repulsive. I think God went a little too far with that practical joke. I’d be interested in hearing some observations from my readers to prove further that God has a silly, sometimes twisted, sens of humor. **Don’t forget** if you have a mental health blog to list it at the newly created Mental Health Blogging Directory. If you’re not a mental health blogger but would like a little exposure, you can sign up as a guest. Mmmmmm, you’ve made me quite hungry now…I need some chocolate.. Dark chocolate helps moods and has antioxidants! @da old man – But chocolate IS good for you. It’s been scientifically proven. Chocolate is its own food group. After all, what goes better with chocolate than more chocolate?!? One of my favorite chocolate confections was buy Dryer’s Ice Cream, a few years back they had a Dreamery line (basically competition for Hagen Das), anyway, one of their Dreamery brands was called “Nothin’ But Chocolate”. It had dark chocolate ice cream, milk chocolate ice cream, with fudge brownie chunks, and dark chocolate swirls. It was just HEAVEN in a pint.Then of course there is German Chocolate Cake!! I’m still not quite sure how the German people got a hold of coconuts, but I’m just glad they did! Can I be an otter too, then? 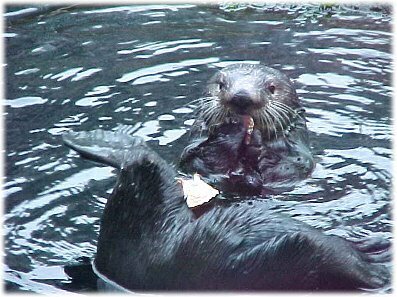 It feels like the sea otter was posted just for me…like Snoopy and Tigger and Schoolhouse Rock. Thank you for making me smile!!! @melinda Good point. I never really believed in the concept of hell, but if it’s anything like having to eat an entire fat free dinner then I don’t want to go. @da old man I’m one of those odd people who actually likes broccoli, however, put a stalk of broccoli in front of me along with a chocolate bar, there’s no mistaking which I’m going for. G-d is a pranster. Proof positive. Chocolate tastes so unbelievably good. I mean, it’s hard to think of anything better. Chocolate cake, chocolate ice cream, chocolate pudding, chocolate chunk pecan cookies. Just plain chocolate…mmmm. So,where does he hide the vitamins and nutrition? In broccoli. Good one, G-d, good one.